That's how many metro areas – New York, Chicago and Los Angeles – in which Amazon is now offering a rebranded service to its marketplace customers called Amazon Shipping, the new name for what was initially called Shipping with Amazon (SWA) when it was tested in LA in 2018. Based on a report fro Amazon-focused research company TJI Research, Amazon Shipping is said to involve Amazon picking up packages directly from select marketplace customers it is "inviting" to be part of the program. This would include daily parcel picks Monday to Friday and deliveries seven days a week to customers nationwide. Marketplace customers sell over the Amazon web site but traditionally do their own order fulfillment. This full seller-to-customer shipping service is just the latest sign that Amazon not only its developing its long denied plans to become a major parcel carrier of its own, but also has ambitions of being a major logistics service provider beyond parcel shipping. That's how many US retail stores Walmart at which will deploy mobile floor scrubbers to replace work down each night by human beings, who generally take 2-3 hours to do the job manually. That as the retail giant looks to automate a number of tasks to reduce costs. That according to an article this week in the Wall Street Journal. In addition to the floor scrubbers, at least 300 stores this year will add machines that scan shelves for out-of-stock products, following tests of the machines as we reported in 2018. 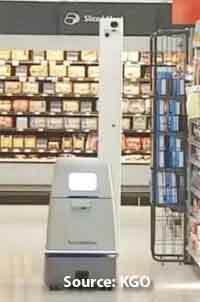 Those robot use vision systems on robots traversing store aisles to check on inventory positions. What's more, Walmart also says it will also double its deployment of conveyor systems that automatically scan and sort products as they come off trucks to 1,200 in total. Those inbound systems cut the number of workers needed to unload trucks by half, from around eight to four workers, said executives at a company presentation last June. "With automation we are able to take away some of the tasks that associates don't enjoy doing," said Mark Propes, senior director of central operations for Walmart US. "At the same time we continue to open up new jobs in other things in the store," including 40,000 store workers already hired to pick groceries from shelves to fulfill on-line orders. That's the estimated number of US retail stores in the clothing, electronics and furniture areas that will be closed by 2026, when on-line shopping is expected to make up 25% of retail sales, according to a new report from the analysts at UBS. UBS estimates that roughly 16% of overall sales are made on-line currently. All told, UBS predicts 1,000 apparel stores, 10,000 consumer electronics stores and 8,000 home furnishing stores will be shuttered in the next seven years. 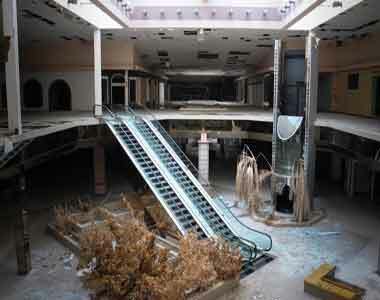 (We have to wonder how many stores in those retail sectors could possibly be left after such massive closures). The report also cited data finding that the average US household spent $5,200 on-line last year, up nearly 50% from five years earlier. "This is a healthy cleansing for the retail industry," said John D. Morris, senior brand apparel analyst for financial services firm D.A. Davidson. "We're in the middle of a multi-year retail purge. Companies are finding that when it comes to stores, less is more." That's one way to put it. That is the revised forecast this week from the International Monetary Fund for global economic growth in 2019, down from 3.5% predicted in January. What's going on? Global economic growth in 2019 is off to a worse start than was apparent earlier in the year, with nearly the entire world economy stumbling, the IMF said. In explaining the lowered expectations, the IMF pointed to an environment of increased "trade tensions and tariff hikes between the United States and China, a decline in business confidence, a tightening of financial conditions, and higher policy uncertainty across many economies." Another key factor: global trade, which had been growing at about 5%, expanded by only 3.8% last year and is forecast to rise just 3.4% in 2019. The US economy, while seen outperforming other developed economies, also got a downgrade, from a forecast of 2.5% to 2.3%.